The World Association of Zoos and Aquariums (WAZA) describes its goals as being “to guide, encourage and support the zoos… of the world in animal care and welfare, environmental education and global conservation.” These goals in reality boil down to two: care (including welfare) and conservation (including education). However, endorsing both care and conservation as goals doesn’t mean that the relationship between them is straightforward. Sometimes these goals are in tension. For example when zoo-raised animals are released in the wild they typically face hardship, but such releases may serve to help endangered wild species to survive. Conservation usually refers to the protection of species and habitats. WAZA’s 2015 strategy document, for instance, describes successful conservation as “securing populations of species in natural habitats for the long term.” Conservation focuses on protecting species of animals in particular places, and this requires sufficient numbers of animals with the appropriate genes for successful reproduction over time. Zoos can pursue this goal through breeding animals of an endangered species for the purpose of future reintroduction in the relevant place. But they can also raise money for conservation programs in situ or use education to develop visitors’ awareness about and concern for conservation. Care, in this context, may have different meanings. It can refer to “caring for” in the sense of looking after animals, a meaning connected with “welfare.” Thus caring for animals in zoos may mean ensuring that they have good welfare. Good welfare not only entails freedom from lasting or severe pain, prolonged hunger, or other forms of suffering, but also that the animals have opportunities for positive experiences, such as pleasure or excitement or the freedom to perform natural behaviors. However, promoting welfare is not straightforward, as different aspects of welfare can conflict. For instance, allowing natural behaviors may, on some occasions, lead animals to undergo negative experiences. Thus in some species young male animals may fight and injure one another; this is natural behavior, but it is likely to produce painful experiences. Care may also refer to the development of caring feelings such as sympathy and empathy in those people who look after animals living in zoos and especially those who visit zoos. These feelings of care might extend beyond the particular animals in the zoo to other animals, for instance companion or farm animals. Clearly—as the WAZA statement indicates—zoos take both conservation and care to be important concerns. But we can easily see the tensions between them. In particular, a focus on conservation may require practices that aren’t easily compatible with caring for animals’ welfare. For instance, conserving endangered species requires sufficient genetic diversity among the remaining species members to ensure continuing species health. Achieving such diversity may mean moving individual animals between zoos, so that they mate with the most genetically appropriate partners. But movement between zoos is often challenging to the welfare of the animals involved. Another concern is that some species of high conservation value, such as Cheetahs and Forest Duikers, can’t easily achieve good welfare in captivity at all. Zoos can deal with these tensions in different ways. They might choose to prioritize conservation, even where this impacts animal welfare negatively. Or they might weigh conservation and care on a case-by-case basis, choosing, for instance, not to sacrifice animals’ welfare for small conservation gains, but accepting some costs to animals’ welfare if saving a key species is at stake. However, there are strategies zoos can pursue that can at least make these dilemmas less stark, and may help zoos to optimize care for—and about—animals, while at the same time promoting conservation of species. For instance, the abundance of threatened species is such that zoos cannot possibly keep all of them. So species must be selected; and this selection may enable zoos to optimize care as well as conservation. Certain amphibian species, whose psychological needs are less complex and challenging in captivity than mammals would make good candidates for captivity. Currently only 6.2 percent of globally threatened amphibian species are represented in zoos even though 41 percent of amphibian species are listed by the International Union for Conservation of Nature (IUCN) as threatened or extinct in the wild. Other possible strategies for promoting care and conservation include keeping fewer species in larger numbers and keeping more local species. Local and endemic species are adapted to local climate, and the animals will be less stressed by reintroduction into the wild if there isn’t far to travel. If population sizes are larger, there’s less need to move animals for conservation breeding programs, and bigger, more specialized facilities that would provide better welfare are possible. However it’s also important to think about how these strategies may affect the number of people visiting zoos. That people come to zoos is important both because of visitor education (no visitors, no education) and in terms of generating funds for conservation projects. Perhaps visitor numbers would drop off if zoos held amphibians (rather than charismatic mammals) and local, rather than exotic species. Research doesn’t help us much here. It’s not very clear what brings visitors to zoos, nor what kinds of animals visitors prefer to see. 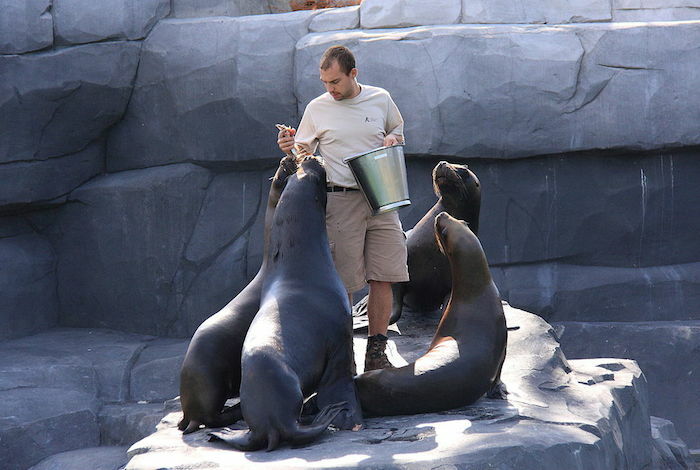 It’s often assumed that zoos need large, charismatic mammals to attract visitors. But some recent research suggests that large body size isn’t a key factor, and that small-bodied animals may do better. However, zoo visitors do linger over mammals. Another recent study suggests that visitors rate seeing local species as a high or very high priority. So smaller species or local species shouldn't discourage visitors. But mammals do seem important to maintaining public interest. To attract visitors, while also optimizing care, zoos may need to hold some non-endangered but cute or spectacular mammals specifically selected for good welfare in captivity. Clearly, zoos have difficult choices to make when it comes to achieving their stated goals simultaneously. In the future zoos need to show that they play a key role in protecting endangered species and their habitats, while at the same time providing the highest levels of care for their animals and working to promote caring attitudes toward animals from zoo visitors. To do this will involve developing further strategies that aim to optimize both care and conservation. The World Association of Zoos and Aquariums. (2014). About WAZA. Retreived from http://www.waza.org/en/site/about-waza. The World Association of Zoos and Aquariums. (2015). Committing to Conservation: The WAZA Strategy. Retreived from http://www.waza.org/en/site/conservation/conservation-strategies. Palmer, C., Kasperbauer, T.J., & Sandøe, P. (Forthcoming). Bears or butterflies? How should zoos make value-driven decisions about their collections? In B.A. Minteer, J. Maienschein, & J.P. Collins. (Eds. ), The Ark and Beyond. Chicago, IL: University of Chicago Press. Clare Palmer is currently Professor of Philosophy at Texas A&M University. She has worked in environmental and animal ethics for several decades. Peter Sandøe has been professor of bioethics at the University of Copenhagen since 1997. He was educated in philosophy at the University of Copenhagen and the University of Oxford. Since 1990 the major part of his research has been within bioethics with particular emphasis on ethical issues related to animals, biotechnology and food production. Bears or butterflies? How should zoos make value-driven decisions about their collections? How can zoos and aqauriums foster cultures of care and conservation?